This headset is rated for medium to loud environments. That means the microphone is noise canceling and so your lips need to be touching the mike in order to get good audio. An inch away and the Tx audio will be weak. This is the same as for the H-250 and M-80. It has two U-229 plugs, the short one for a radio and the long one for an intercom. The switch has three positions, momentary Radio Talk, center listen to radio and in the intercom position both talk and listen on intercom. There is a "bail out" connector to allow the operator to leave a vehicle with the headset still attached. The earphones will fit under a helmet. The "E" version, and maybe all versions, are designed to be used with both the intercom and radio connectors connected and the radio ground to be common with the intercom ground. This means that if only the radio connector is connected to a radio like any of the PRC-68 family the headset will NOT work. 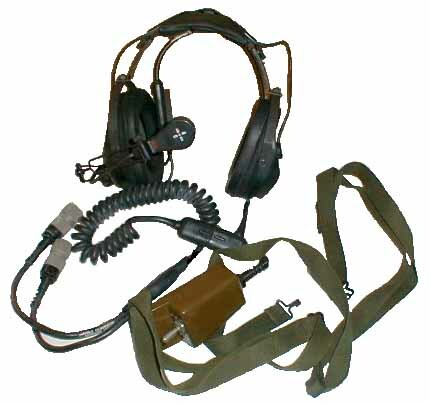 If both connectors are connected, like onto both AUDIO connectors on a PRC-25, PRC-77 or PRC-104 radio the headset will work. With both connectors connected to a radio the mode switch changes function to either the conventional Push To Talk and an Always Talking mode. The latter might be handy if you're into really long rag chews, but could be problem if you get into Talk Always mode and don't know it. Note that the 1966 version of the TM that includes changes 1 & 2 only covers the no change and "A" versions. The headset I have is an "E" version. 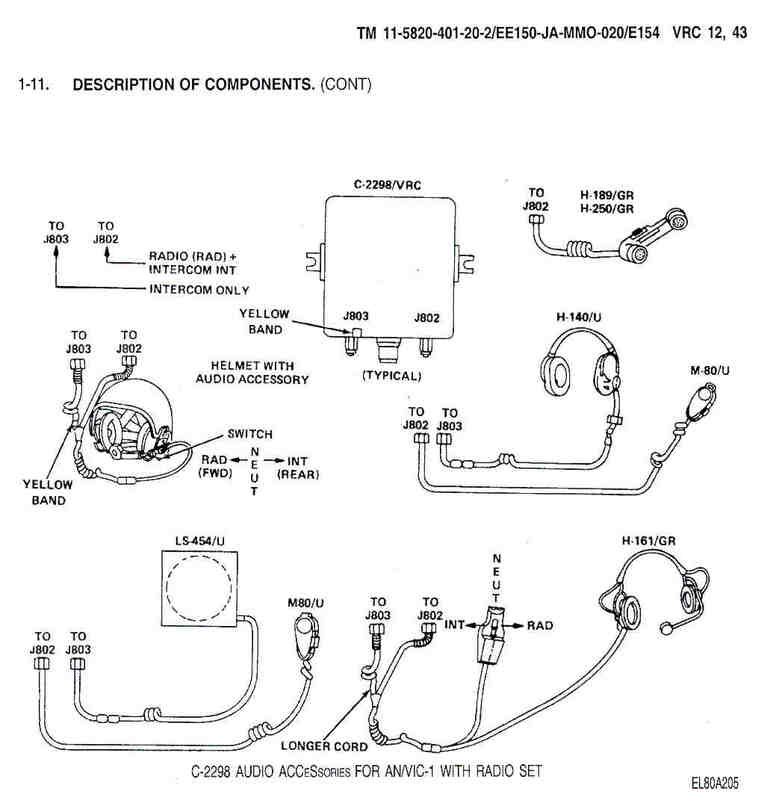 The manual shows different for no change headsets (only "C" PTT is on P1, so you need both connectors on a radio to use it) and the "A" version has "A, B, C and D" on P2 so just this connector will work for a radio. Don't know about all the other versions. TM 11-5965-262-13.pdf available from ETM on line. The H-161 is part of the AN/VIC-1 system as described in TM 11-5820-401-20-2 available on line at ETM. 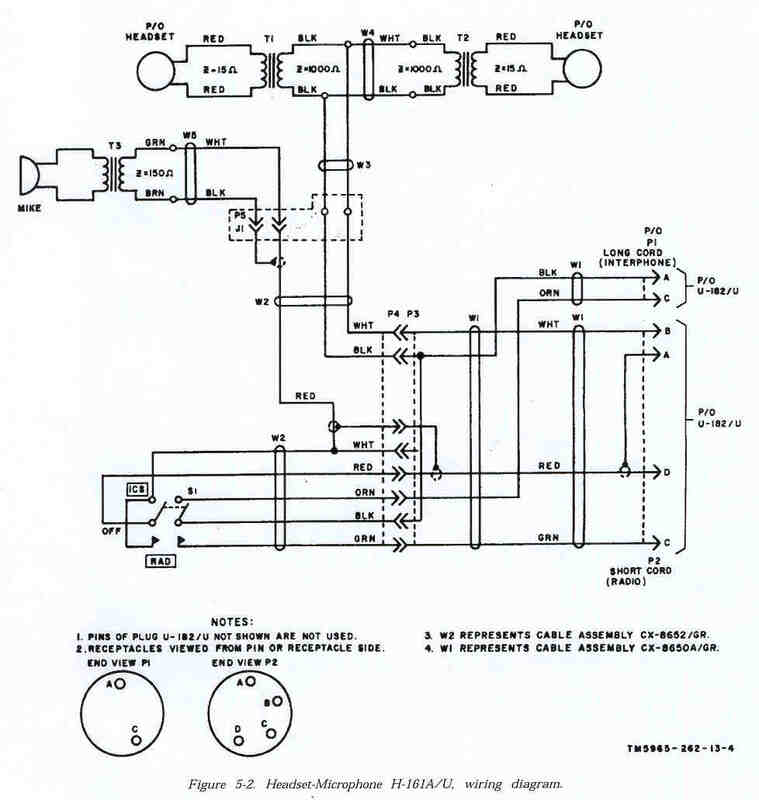 In paragraph 1-11 is a diagram showing the H-161 connected to a C-2298/VRC control box. The CX-13075/U is a "Y" cable that can be used to allow the use of the H-161 headset on equipment with only a single AUDIO connector. H-161A Schematic (different from H-161) - Pin A on the Radio AUDIO connector seems to have no connection to the rest of the headset!!! This means that When connecting to a mil radio the headset does not work since pin A is ground for all the other pins! But pin A of the INTERPHONE connector does have pin A as a ground. On a new in box H-161E the adjustment for how high or low the ear pieces are was almost impossible to move. You need to apply a small amount of Silicon grease on the mating surfaces of the headband on both sides and work them back and forth. Once movement is free, then you can wipe it all off, but you really can't and what's left does a great job. [an error occurred while processing this directive] page created 15 July 2001.